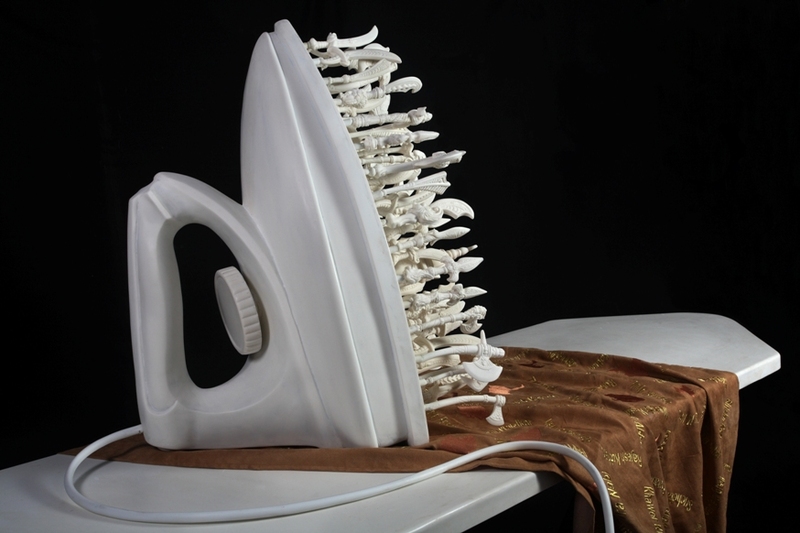 ‘The Ironing Board’ refers to the highly fortified relationship that India shares with its neighbour Pakistan and the uncertain nature of the peace process between the countries. 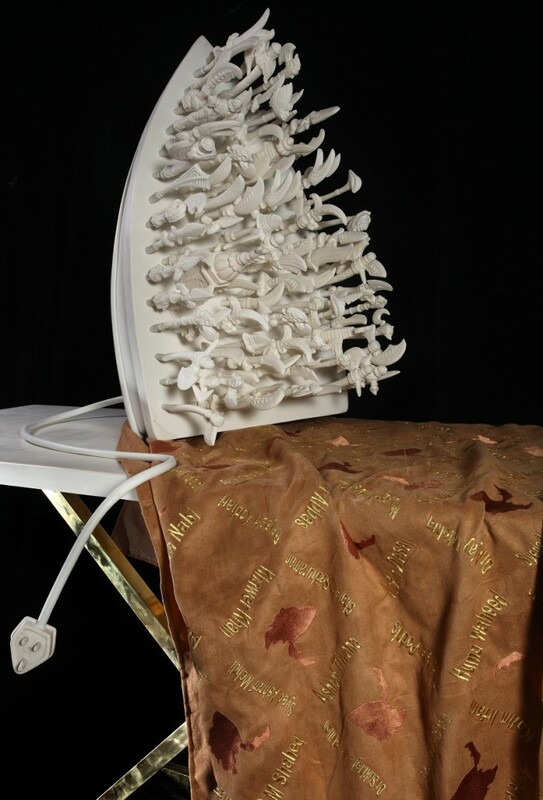 The sculpture of an oversized iron placed on an ironing board seems dysfunctional due to the surface being densely loaded with numerous weapon-like projections. On close observation one would find, amongst other weapons, truncated rooftops of religious monuments. 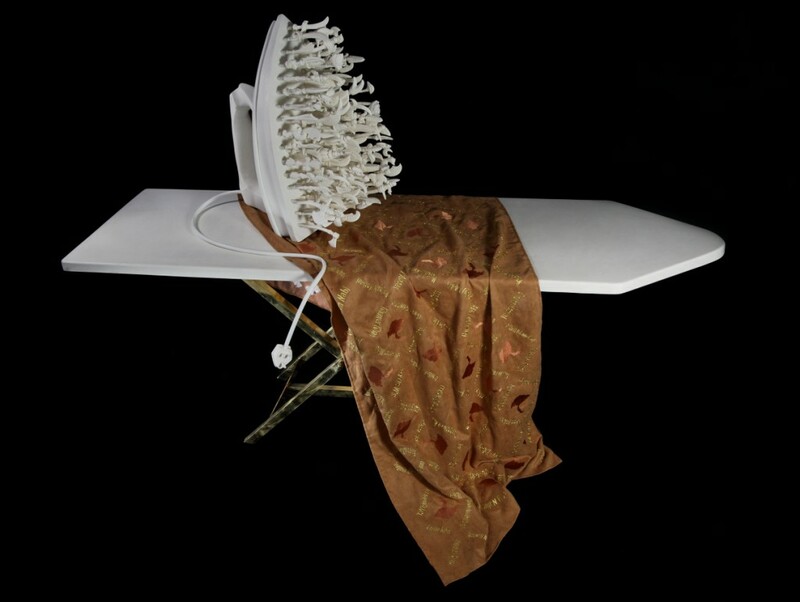 The fabric that lies draped waiting to be ironed is embroidered with names of those who’ve signed the petition for peace between India and Pakistan along with multiple maps of the disputed territory between the two countries, an image that recurs in many of my works as a space symbolic of human inanity. 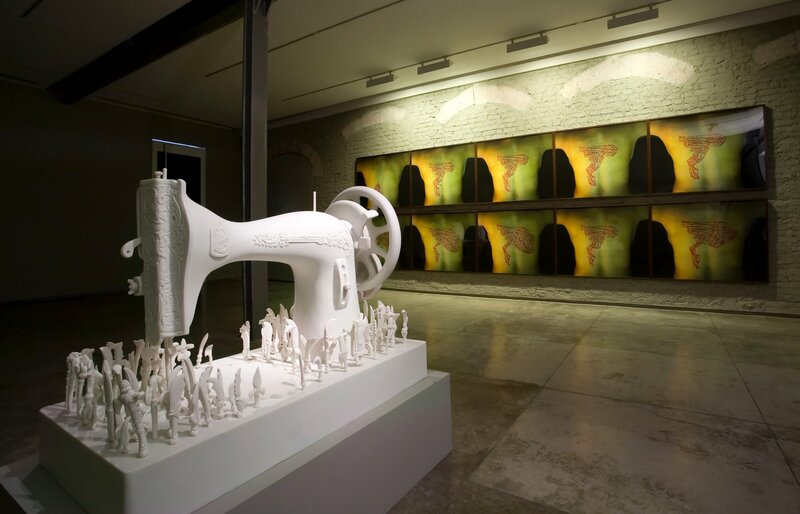 The sculpture playfully renders the frustrations of the never-ending dialogue, where any attempts at ironing out creases in the peace process are sabotaged by conflicting interests and with the misuse of religion as a divisive tool by both countries. Born in 1973, Delhi, India. Lives and works in Delhi, India. 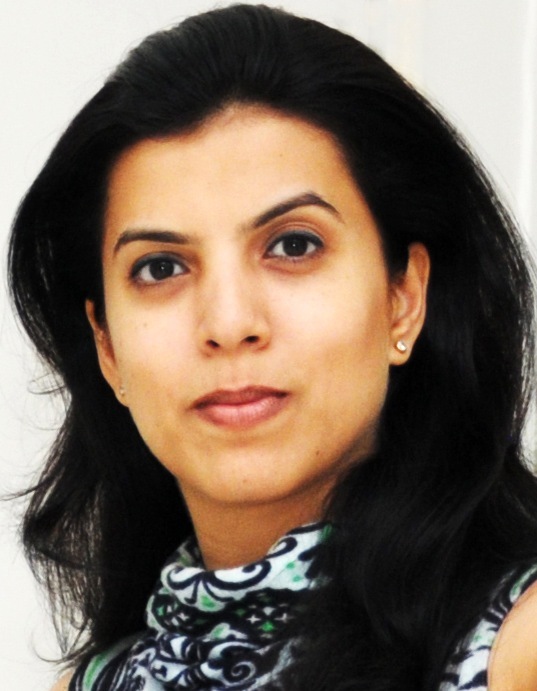 Reena Saini Kallat graduated from Sir J. J. School of Art, Mumbai in 1996 with a B.F.A. in painting. 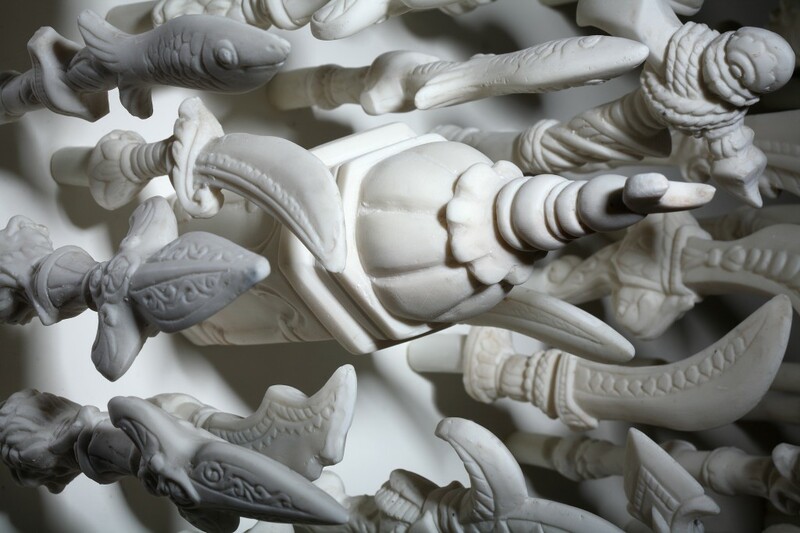 Her practice – spanning painting, photography, video, sculpture and installation, often incorporates multiple mediums into a single work. She frequently works with officially recorded or registered names of people, objects, and monuments that are lost or have disappeared without a trace, only to get listed as anonymous and forgotten statistics. 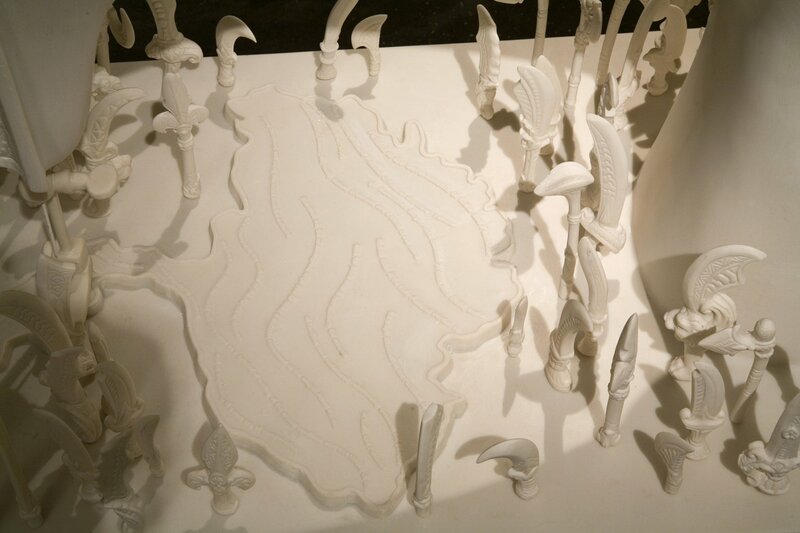 One of the recurrent motifs in her work is the rubber stamp, used as an object and an imprint, signifying the bureaucratic apparatus, which both confirms and obscures identities. 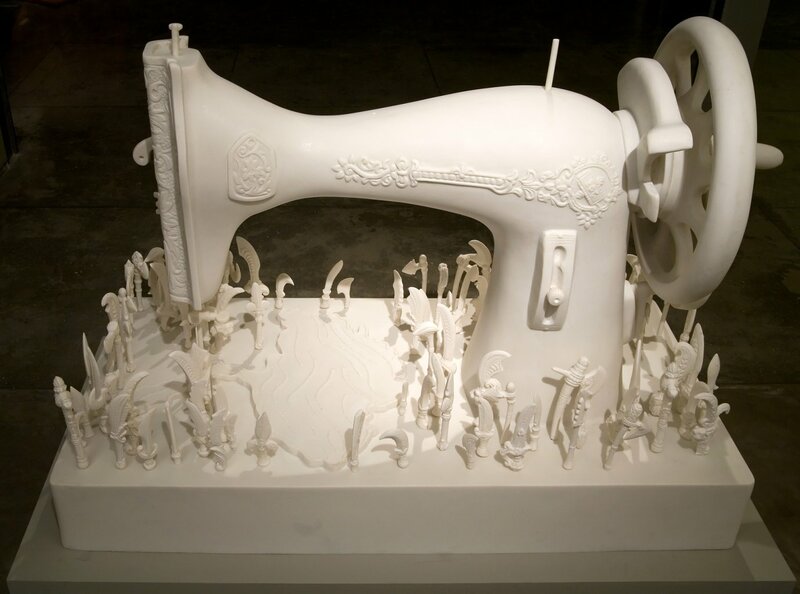 Her work has been widely exhibited across the world and she has participated in a number of workshops and residencies. She lives and works in Mumbai.